Pete Meyers from Moz spotted potentially a new ad format from Google named "Read Now Ads." 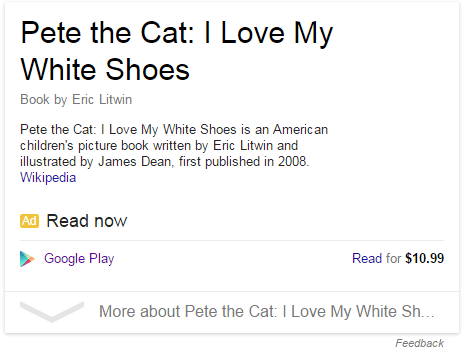 The ad if for a book named "Pete the Cat: I Love My White Shoes." Whereas the typical ads you'd see are from Google Shopping, these are integrated with Google Play for digital reading. It reminds me of the Listen Now Ads but for digital reading versus digital music.